The Sonos Connect:Amp is the perfect product when combined with Q Acoustics Qi65CB Ceiling Speakers for the beginnings of a home multiroom audio set-up. If you are looking to play audio from a range of sources, such as from mobile, other non-amplified audio units or from streaming devices such as the Amazon Echo or Dot, then a Sonos Connect:Amp can fulfil all these needs. Streaming music using your home WiFi connection is fantastic for a multitude of reasons - but most of all, it's more reliable than Bluetooth, and if you need to take a call on your mobile, your music won't cut out as it would do again when using Bluetooth. With a powerful amplifier coming in at 55W per channel (at 8 Ohms), and paired with high quality Qi65CB ceiling speakers from Q Acoustics, you can be sure that your listening habits will be radically re-imagined. 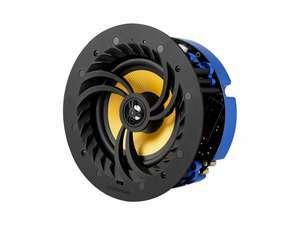 Qi65CB Ceiling Speakers, whilst designed and created with budget in mind, are nevertheless exceptional value in terms of performance and efficiency that require less than half the amplifier power of the superior Qi65C ceiling speakers to produce the same level of volume. With 6.5" speaker cones, the Q Acoustics Qi65CB speakers are a good size to fill average sized rooms with ease for general background audio, and have a modern finish thanks to their magnetic discreet grille. The option to add a further pair of ceiling speakers to this package gives you the potential to expand this sound system across more zones producing the ideal Wireless Home Sound System. Be aware that one Sonos Connect:Amp is required for each room/zone, so for a true multi-room set-up in additional rooms/zones and control for each room/zone, you will to select the right quantity. Want more than one room to be catered for that is of a similar size? Just select the correct quantity needed at checkout. If you have smaller rooms or narrower spaces, think about using stereo speakers which are better suited. Sonos allows you to play a different song in each room throughout your home, as well as altering the volume levels for each room separately. Streaming services such as Apple Music, Spotify, Deezer and many more feature, as well as pre-loaded internet radio stations providing you endless music to enjoy from any device connected to your WiFi network running the Sonos app. Using an Amazon Echo or Dot will also mean you get voice control to request the music you love, when you want it (Amazon Echo or Dot not supplied). You can also manage your audio easily through the app to connect other devices to your Sonos Connect:Amp (if not already connecting a device such as Amazon Echo or Dot) through the analogue audio input - meaning you can connect your TV, DVD, HiFi, MP3 players and more.